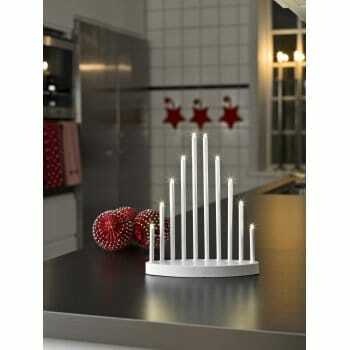 Konstsmide 10 light welcome light is a modern festive addition for your Christmas decorations. This contemporary design features an oval base in white lacquered finish supporting 10 slender candle sticks which are situated along one side of the base in an ascending height arrangement with LED lights. A festive display of warm welcoming light for yuletide windowsills is provided through the use of integrated warm white LED bulbs. Mains operated, suitable for indoor use only, comes with cable and and transformer included. Also available in anthracite grey,black or brushed metal finish and a larger 15 light welcome light all of which can be ordered from our website.